This is Alfred Hitchcock’s most visually beautiful movie. 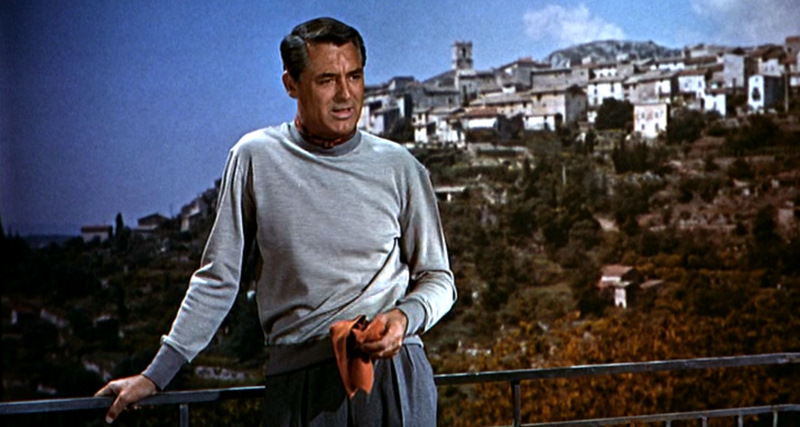 Filmed on the French Riviera, the gorgeous hills, dotted with old mansions overlooking the Mediterranean Sea vie with the stark beauty of Grace Kelly and chiseled features of Cary Grant to provide enough eye candy to last a lifetime. The following review contains plot spoilers. The story is simply an excuse for the beauty. American ex-patriot John Robie (Cary Grant) is a former jewel thief who was known as “the Cat” before World War II. He paid his dues by fighting in the French Resistance, killing over 70 Nazis proving his loyalty to France. After the war, he put aside his thieving ways and lives respectably and very well, thank you, in a villa on a ridge overlooking the Mediterranean. This idyllic life is disturbed when a copycat burglar begins stealing the most expensive jewels on the Riviera. When the Police come calling, thinking he has renewed his life of crime, he evades them in a breathtaking car chase through some of the most beautiful scenery in the world. Turning his car over to a woman on the street, he hops a bus and sits next to Alfred Hitchcock. He goes to see his old friend from the Resistance, Monsieur Bertani (Charles Vanel), who runs a restaurant that is manned by head waiter Foussard (Jean Martinelli) and more of their old Resistance buddies, who are all suspicious that the Police are right about Robie. Bertani helps him escape with the aid of Foussard’s daughter, teenager Danielle (Brigitte Auber) who has a crush on him. 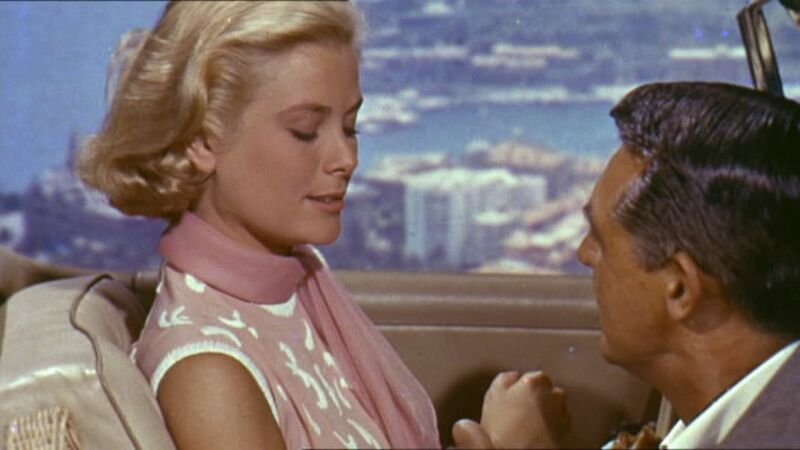 She takes him across the water to the Hotel Carlton, where beautiful American tourist Frances Stevens (Grace Kelly) sees him. He makes contact with a British insurance company representative, H. H. Hughson (John Williams), and pleads his case, that he is innocent and only wants to catch the thief to clear his name. Caught by the Police, Robie is released due a lack of evidence and convinces Hughson to give him the names of his clients who have the most expensive jewels waiting to be stolen. Abashed at having already had to pay out huge sums, Hughson agrees, also sharing the list with the Police to hedge his bets. He begins by meeting rich American tourist Jessie Stevens (Jessie Royce Landis), mother of Frances, and posing as a rich Oregon timber man. After a stimulating evening, he escorts the two ladies back to their rooms, but before he can depart, Frances gives him a passionate kiss and arranges to meet him the next day. While swimming, he runs into Danielle and Frances becomes jealous. She and Robie take a drive to look at villas and are followed by the Police. When he asks her to drive a little faster, she speeds up considerably, taking a kind of devilish delight in tempting fate. They safely evade the Police and find a nice spot overlooking the sparkling waters of the Mediterranean and she tells him that she’s figured out that he’s actually John Robie. He denies it, but after lunch the end up kissing again. She tells him to meet her in her room to watch the fireworks or she will reveal who he really is. That night, she seduces him again, proposing that they go into business together as burglars. He continues the façade of being a tourist, but when she goes to sleep, he keeps watch in her bedroom. During the night, however, the burglar robs Jessie of all her expensive jewels and finally Robie reveals himself to them. Frances calls the Police on him and he departs over the rooftops as they arrive to search for him. Hiding out, he stakes out what he thinks is the next target, alerting Hughson and putting the Police on notice. As he waits in the dark, he is attacked by a man dressed in black. Struggling, he throws the man over the cliff. The Police find the body of Foussard in the Sea and announce that he was the burglar, clearing Robie of charges. At her father’s funeral, Danielle becomes distraught and calls Robie a murder. Chagrined, Frances again hooks up with Robie and he tells her of his plans to capture the real burglar by attending a fancy costume ball. The Police follow and also stake out the ball, which Bertani is catering, with Danielle’s help. After changing disguises with Hughson, Robie waits on the roof for the burglar to show up, but when he does, it turns out to be Danielle. On Robie’s hillside villa, Frances kisses Robie again, remarking that her mother is going to love the house. From beginning to end, the cinematography is stunning, so much so that the film won Robert Burks, Hitchcock’s longtime associate an Academy Award. Although nominated for her incredible costuming, especially of Grace Kelly, Edith Head did not win. This film has a different feel than most of Hitchcock’s work. Although it contains a lot of humor, the film is not a comedy. There is certainly some mystery as to who the real burglar is, but the film lacks the tension and suspense that mark most of Hitchcock’s movies. In truth, this is a feel-good romance, concentrating, as it does, so intensely on beauty. 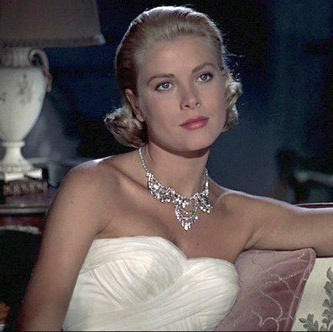 This was the last film he made with Grace Kelly before she married Prince Ranier of Monaco and gave up acting and it is appropriate that she shows so well. Stunning in an array of dazzling Edith Head costumes, the three gowns she wears are all breathtaking. It moves at a really good clip, coming in at under two hours, and you never notice the time passing because there is always so much beauty for your eye. It is a fun movie, something you can’t really say about too many Hitchcock films and it transports you to a time and place full of such charm that it can honestly be said to elevate one beyond the every day. A stunning film! I highly recommend this movie for all audiences.